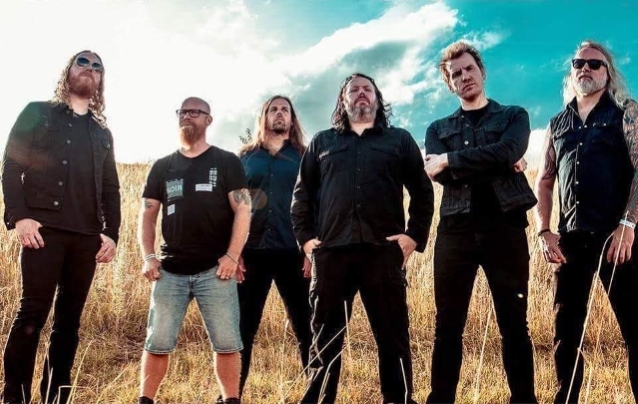 Prior to DARK TRANQUILLITY's performance at New York City's Gramercy Theatre on September 7, vocalist Mikael Stanne spoke with Heavy New York. The full conversation can be viewed below. A few excerpts follow (as transcribed by BLABBERMOUTH.NET). Mikael: "Of course. It's a nightmare. What do we do — do we play old stuff? Do we play new [material]? How do we set it together? What do people want to hear? What do we want to play? What feels comfortable? What works on stage? All that stuff. It doesn't get easier at all. It only gets harder. Also, you want to find something that's fun to play and fun to perform, and something that works for the musicians. It's a nightmare." Mikael: "We grew up a certain way. Our influences inform the way we write music and how we talk about music and how we communicate musically, so even though our musical interests change and we start listening to all kinds of stuff and you want to incorporate that somehow into our music, it's still the same foundation that we build on. Even though we try to evolve and try to do totally different things, it still ends up being very much DARK TRANQUILLITY because of the shared musical qualities that we enjoy — the kind of melodies that we enjoy, the kind of beats, the kind of rhythms that we grew up on. That's [all] going to be present there, so obviously, it's still going to sound like us no matter what we try to do. Try as we might to get away from our own sound, we're still there. It's hard for us to get away from, and I like that." Mikael: "The riffs and the chords are the most important. The melodies come first. Whenever Anders [Jivarp] writes, for instance, he's a drummer but he still really focuses on melody as well. For him, it's all about the melody and the song structure. When Martin [Brändström] writes songs, it's more about mood, because he's a keyboard player and he wants to feel the emotion like that. When Niklas [Sundin] writes songs, it's different as well — he has a different kind of focus. It all depends, and that's what's interesting. For me, I come in after those songs are written and then I try to put my kind of thing on it and try to grasp what the intention of the song is, and try to make something out of it. For me, it's fascinating to see how that works." Mikael: "We lived in a small suburb outside of Gothenburg. When me and Niklas decided to start a band, we just asked our closest friends who lived close to us — we lived on the same street — and we said, 'Hey, let's form a band.' We started playing, and that was it. Of course, it helped to be encouraged by other bands, because there were other bands around. Then, as more bands started, it was easy to get things going and start shows and get encouraged and also get inspiration and help from other bands – their experience with touring or record labels or whatever helped us. It was definitely easier when you're not alone in the world, or in a small town where no one else cares about music. Gothenburg always had a scene — not a death metal scene, but at least... anything outside the norm was OK. There was a club where all that stuff was possible, and that's why we could have shows. Obviously, that helped as well. I don't know how different that is from anyone else's experience in any other city, but for us, it was rough — we struggled as any other band — but we didn't really think of it that way. It was not about 'making it.' Being in the rehearsal room and being in my parents' garage playing music, that was it, and if we could actually perform in front of a crowd and do a show in a club, that was awesome as well, but that was not the main focus. It was all about coming up with something together and playing. That was it. Everything else kind of happened." Mikael: "It's maybe weird to say, but some of my absolute favorite bands in any genre are Swedish bands, or even some of my friends from Gothenburg. When it comes to progressive metal, EVERGREY is as good as it gets. When it comes to doom and sludge, MONOLORD is one of my favorite bands. When it comes to progressive rock, there are some incredible Swedish bands that I love. It's fantastic. I'm really, really happy and super-proud of all the cool music that's being made in Sweden." DARK TRANQUILLITY's eleventh studio album, "Atoma", was released via Century Media in 2016.